IAPS at Central APA: Additional Commentator Needed! The IAPS session for the Central APA meeting in St. Louis, Missouri is scheduled for Thursday, February 19 at 5:30. Aaron Harper of West Liberty University is presenting: “‘You’re the Best Around’: Reconsidering Athletic Excellence in Seasons and Playoffs”. Craig Carley of Phoenix College is scheduled to provide comments. Craig, however, might not be able to attend for personal reasons. I am looking for anyone who would be willing to comment as either a replacement or in addition to Craig. Maybe you are already attending the APA and would like something else to do? Maybe this topic interests you and this is a quick way to jump into the discussion? Please contact me ASAP sklein@rockford.edu if you are interested and I will send you the paper (you can also check out Aaron and I discussing some of the ideas from the paper in my Sports Ethics podcast with Aaron on the Value of Playoffs and Championships). Along with its general popularity, sport as an object of academic study has been steadily growing for decades across disciplinary boundaries. As such, this year’s Sports Studies Symposium seeks to explore the state of the study of sport. Discussions of cross-disciplinary research or approaches to the study of sport. Of course, this is by no means an exhaustive list; a myriad of approaches are welcome and encouraged. We invite and encourage contributors from any discipline. Each presenter should plan on 20 minutes for his or her presentation. There will also be time for Q&A. Abstract should be 300-500 words. Send via email (as PDF) to sklein_at_rockford_dot_edu. If you have any questions, please contact Shawn Klein: sklein_at_rockford_dot_edu or Michael Perry: mperry_at_rockford_dot_edu. If you are interested in commenting on this paper or acting as the session chair, please contact me at sklein@rockford.edu no later than September 26, 2015. Please include a brief bio (your institution affiliation, position, recent relevant work, etc.) or a CV. The group meeting takes place as part of the Central Division Meeting of the American Philosophical Association which will be held February 18-21, 2015 in St. Louis, Missouri. Please note commentators and chair must be members of both IAPS and APA. 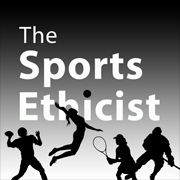 A new episode of The Sports Ethicist Show is available! The 3rd annual Sports Studies Symposium was held April 25, 2014. In this episode, the symposium participants discuss the ideas raised by the papers given at the symposium. In the first part of the episode, Mike Perry and Shawn E. Klein talk with Sean Beckmann and Kevin Schieman about the 10,000 hour rule and what distinguishes sport from other kinds of physical games. In the second part, Shawn E. Klein, Zachary Draves, Huston Ladner, and Carl Robinson discuss the relationship between sport and society, cyborgs, and the value of spectatorship. You can subscribe to the podcast at iTunes. 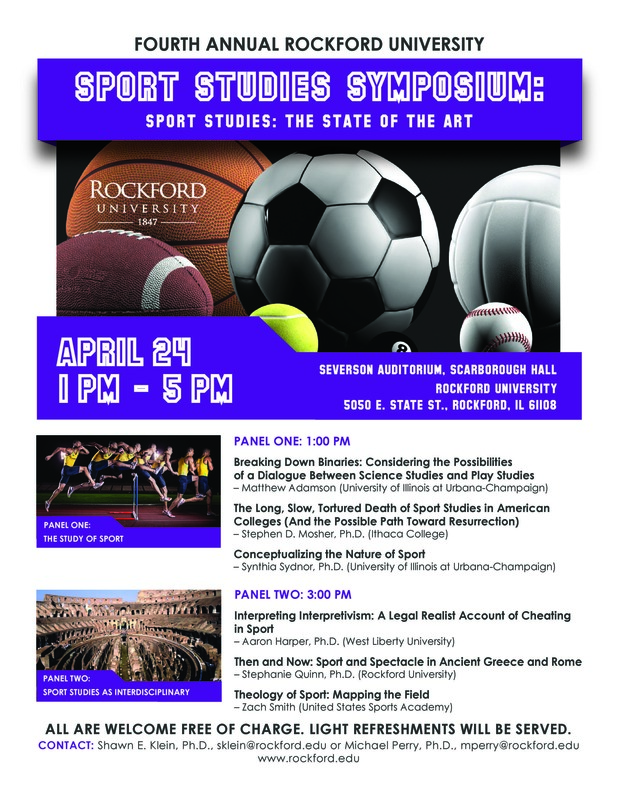 Rockford University is hosting the Third Annual Sports Studies Symposium on April 25, 2014 from 1:00pm to 5:00pm CT at the Grace Roper Lounge, Burpee Center. The conference is free to attend and light refreshments will be served. The Sports Studies Symposium is hosted by Rockford University professors Dr. Shawn Klein and Dr. Michael Perry. For more information please visit www.SportsEthicist.com or contact Dr. Shawn Klein at sklein@rockford.edu. I got word today that my proposal for the 2013 International Association for the Philosophy of Sport Conference has been accepted. The conference is September 4-8, 2013 at California State University, Fullerton. I am very excited! The concept of play is one of the most discussed concepts in the philosophy of sport. The relationship between play and work, however, is less explored. But when it is, the assumption is that work and play are radically separate activities. In this paper, I want to challenge this assumption and argue that a clearer understanding of these activities shows us important parallels between work and play. What makes professional athletes professional is not merely that they are paid for what they do. Sport is the activity that they engage in to be productive and to create the material wealth for their lives. It is, in other words, that sport is their work. Play, on the other hand, is presented as the contrary of work. As Kenneth Schultz says, “[i]t seems easiest to see that play is not work” (26). Roger Caillois in Man, Play and Games says that the goal of play is not to produce anything: “it creates no wealth or goods…[it] is an occasion of pure waste” (5). And of professional athletes, he says “it is clear that they are not players but workers” (6). Similarly, Johan Huizinga argues in Homo Ludens that play can have no material interest or profit gained from it. I will argue, first, that it is not obvious that material interest or productivity is incompatible with play. Second, I will argue that while there is a real distinction between play and work, the one-dimensional dichotomy drawn in the literature misses important and substantial similarities between work and play. Getting these concepts right is important because both work and play are significant human activities; they are components of a flourishing, well-lived life. We form our lives around our careers and often we derive, in addition to the means of material support they provide, great satisfaction from our work. Play, too, is essential for the good life. It is not merely how we spend our down time; like work, it is a way we structure our lives. Not only because play is a significant source of enjoyment and satisfaction, but also because it is a unique way of expressing and experiencing ourselves. By fleshing out the parallels between these activities—and the ways each can be informed by the other—we can improve each activity and subsequently improve our lives. In short, many conceptions of play and work, as evidenced by Caillois and Huizinga, appear to presuppose a rigid disjunction between work and play that does not do justice to either. By gaining a more adequate understanding of work and play and the affinity between them, we will improve not only our comprehension of work, play, and professional sports, but also the way we actually engage in these activities. Caillois, Roger. Man, Play and Games. I have posted the abstracts for each paper to be presented at Friday’s Sports Studies Symposium. Trisha Phillips, Ph.D., (Mississippi State University): Fandom and Sport: Encouraging Hate. Carl Robinson, Ph.D. (Ashford University): Chasing The American Dream: A Chubby Fan(atic) Recalls His Favorite Professional Wrestlers. 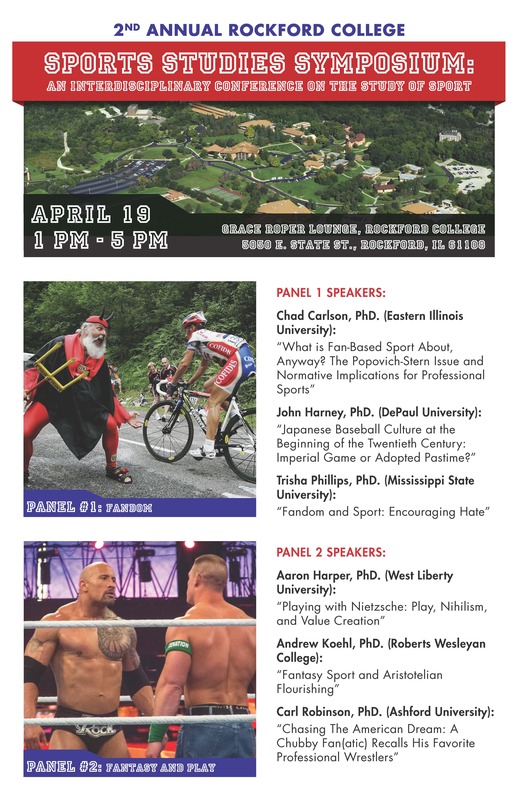 Announcing the 2nd annual Rockford College Sports Studies Symposium! Fans play a central role at all levels and within various aspects of sport, so any study of sport would do well to consider their influences in connection to fandom, fantasy, and play. A specific and growing area of fandom, fantasy sports, illustrates a concrete and complex way fans relate to and even affect sport. This year’s symposium seeks to explore and examine these aspects of the relationship between fan and sport. The first panel, held from 1 to 2:45pm, focuses on Fandom. Trish Phillips, Ph.D., (Mississippi State University): Fandom and Sport: Encouraging Hate. The second panel, held from 3 to 4:45, will focus on fantasy and play. Following the symposium, many of the participants will head over to Aviators Stadium to watch Rockford College Baseball take on Maranatha Baptist Bible College.